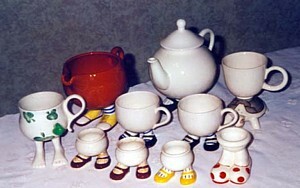 Carlton Ware from Stoke on Trent, Staffordshire England has long been a source of collectors excitement. Whether you yearn for something from the Art Deco period with the fantastic high glaze lightning flashes, stylised flowers or Egyptianesque motifs or from the more affordable saladware range with its dainty embossed flowers or fruit. You may even look for the quirky feet ware from the seventies or those elongated coffee sets in the bright bright colours of the same period Carlton Ware is a force to be reckoned with. The factory emerged in 1890 under the leadership of James Frederick Wiltshaw, in partnership with JA and WH Robinson. They produced useful and decorative wares with blush or white grounds decorated in the mainly floral style popular at that time. These designs ranged from monochrome transfer to multi-coloured or just blue, whatever your taste required. For the first three years of the Company's existence they used a backstamp that did not mention Carlton Ware. This is known as the Ribbon Mark. From 1894 they changed to the Crown Mark which now acknowledged their up and coming household name. New shapes and patterns emerged as the Century turned and with their in-house designer Horace Wain some great patterns were introduced. 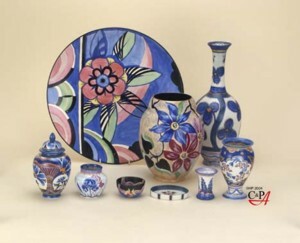 Striking black grounds with floral patterns in pink, or a range based on the Japanese Cloisonne Ware was marketed. Wain had a great interest in the Orient that was transferred onto the wares. Powder blue grounds, twin tones of black and terracotta, or green or yellow were added, these having chinoiserie designs such as Mikado, Barge, Chinese Figures, etc. In the early 1920's Carlton Ware developed a true lustre finish that was available in at least twelve different colours being offered plain or decorated. Some of these lustres were used to produce the much sort after Armand Lustre with patterns such as Lovebirds, Fishes and Cockerells. The same lustre was used to produce the highly desirable Chinaland pattern with is special Crown mark backstamp. The Art Deco period can be classed as the hey day of Carlton Ware's existence. With great designers such as Vi Elmer, Olive Kew and Renee Pemberton they were to produce some stunning and highly collectable patterns. The discovery of Tutankhamun's tomb gave them something to get their teeth into with several elaborate interpretations on vases, coffee ware, ginger jars and dishes. The true essence of the Art Deco movement could be seen with the Red Devil, Jazz, Explosions, Flower and Falling Leaf, Bell, the list is endless. At the same time the factory was to introduce a more utilitarian range known as salad ware. First came the lettuce leaf with either tomatoes, lobsters or combinations of other summer delights. This progressed into much more feminine floral and fruit patterns such as Anemone, Buttercup, Waterlily, Foxglove, Fruit Basket and Cherry. These designs put light onto the breakfast table and were a firm favourite with some of the designs continuing in production until after the Second World War. The 1920s and 30s possibly saw the largest expansion in the company's history. Novelty ware was offered. Cruets as brightly coloured crows, soldiers and drum, squirrel with nuts, napkins as ladies and bells. By 1928 Carlton Ware purchased the bone china manufacturers Birks, Rawlins & Co. This enabled Carlton Ware to produce ranges of delicate tea, coffee and dessert ware. A range of dogs and lady figurines also emerged. 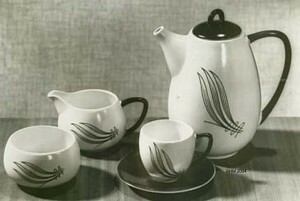 During the same year the factory introduced its Handcraft range. 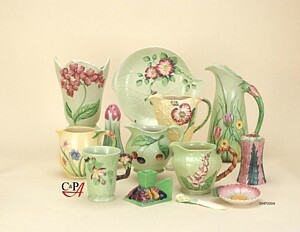 Mainly freehand patterns such as Shamrock, Iris, Russian and Flowering Papyrus on a matt glaze. 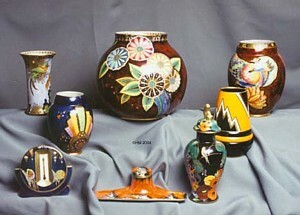 Some Handcraft has a high glaze such as Chevrons and Carre and some have a combination of the two. As the Second World War became a reality the government restrictions caused the pottery industry to decrease. Some factories went, some made munitions and others continued making china but for export only. Carlton Ware continued making pottery within the restrictions which at first only allowed decorated ware to be made for export. Restrictions changed as the war continued where no handpainting was allowed and wares came out plain. Nothing of any substance was to emerge until after the war when the rulings were lifted in 1952. During the war experiments on Rouge Royale, a new colour range, were taking place which, once restrictions were lifted, was to emerge as another favourite for those wishing to purchase Carlton Ware. The backstamp specifically used for this range recognised the fact that the factory could now handpaint again as well as have a new Royale range. Colours included Noire and Verte. Pre-war patterns such as Crane & Willow were used on these new backgrounds. New patterns such as Spiders Web, Mallards, Dragonfly & Waterlily, Eastern Splendour, Kingfisher & Waterlily looked impressive and appealed to the populus. 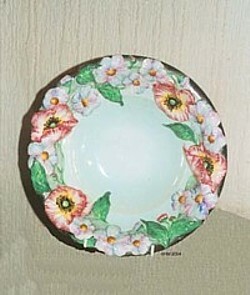 Salad Ware continued with new patterns such as Poppy, Poppy & Daisy, Hydrangea, Convolvulus and Magnolia. New shapes emerged as the decade progressed. The space age played a big part in shapes with the new triform and the fantastic Orbit pattern. Edinburgh, a clean lined shape with the Windswept pattern. The 60s produced more novelty with vegetable and fruit cruets. Apple and Pear tea and coffee sets. In 1966 Cuthbert Wiltshaw died and Carlton Ware was sold to Arthur Wood (Longport) Ltd., with Anthony Wood becoming Managing Director. He was to take the company through the final faze of it's Stoke on Trent history. The 70s with zany colour combinations had Carlton Ware spinning with elongated coffee sets in the Wellington shape decorated with bright oranges or lime green. Incised bird dishes and tea and coffee ware in the incised Persian design or a throwback to the 19th Century silver shapes with Athena. Novelty was not to miss these weird colour combinations as money banks were produced in shapes of horses, owls, faces and even Noah's ark lithographed accordingly. At the beginning of the 1970's studio potters Roger Michell & Danaka Napiorkowska were to turn the tables for Carlton Ware. Unable to cope with the orders for their walking ware they approached Carlton Ware to produce it for them. Their feet were to expand to at least four different varieties, Walking, Running Jumping and Standing Still, Caribbean and Big Foot. There were many other spin offs from this which were just as much fun. Carlton Ware very much had their finger on the pulse and would put their hands to almost anything. Advertising ware was a good source of business and one of the larger orders they would achieve was working with Guinness. The factory produced toucan lamps, jugs, flying toucan wall plaques and a collection of zoo figures. By 1987 Arthur Wood sold out to County Potteries run by accountants and not realising the true essence of the pottery business it was not long after, in fact 1989, that Carlton Ware went into liquidation. The factory site was sold to a development company. The contents were lotted up and sold by auction. The Trade name, some master moulds, pattern, shapes books and goodwill were sold to Grosvenor Ceramics. In the hands of John McClusky Carlton Ware moved to Stone and was re-launched in 1990 lasting for only two years due to the economic climate being on a downward spiral. In mothballs for five years it finally emerged being purchased by Frank Salmon. Mr. Salmon has taken Carlton Ware to a new era, at first making limited edition figures and novelty teapots. As the market has moved on he now produces gollies and tea ware. Carlton Ware lives on both as a second hand collectable or as a new collectable. Be aware that there are reproductions and fakes on the market. The most prolific counterfeits are the Ginness ware. For the discerning collector there is a collectors club, Carlton Ware World Wide run by a committee of keen collectors producing an A5 full colour magazine four times a year together with regional meetings and an Annual General meeting. For further information visit www.carltonwareworldwide.com. Further information on Carlton Ware can be obtained from Helen Martin at www.carltonware.biz.